Nauvoo Times - Jeff Lindsay - Joseph's Magic Maps? 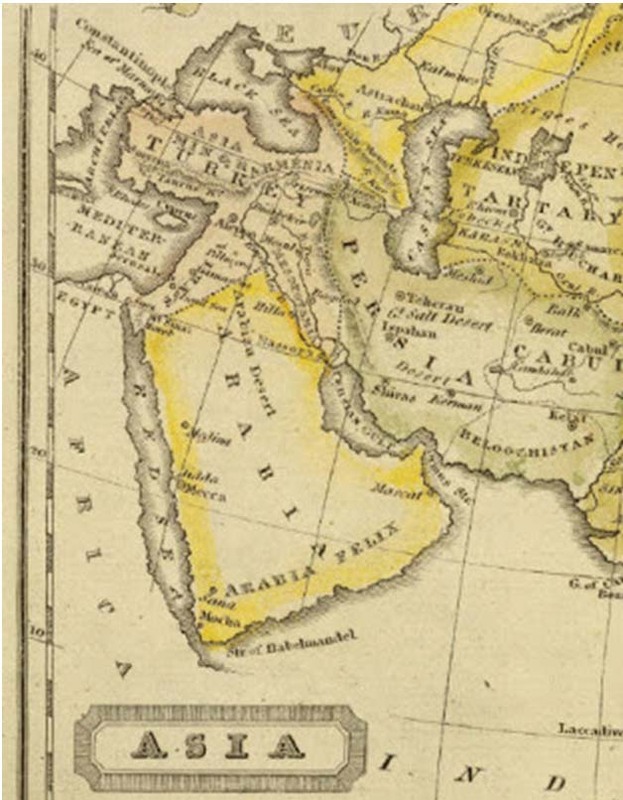 Here is a portion of Jedidiah Morse's 1828 map of Asia showing the Arabian Peninsula (available from the David Rumsey collection of historic maps). So if Joseph somehow managed to gain access to this map, could anyone suggest how he would use this to craft the remarkably plausible description of travel through the Peninsula in First Nephi 16 and 17? You know, directions, place names such as Nahom, plausible locations for Bountiful, Shazer, and the Valley of Lemuel, and so forth? Somehow this map must hold the answer, but I need a little help to see how. Maybe the answer is in the earlier book of Jedidiah Morse, Geography Made Easy. It can be viewed online. You write like an intelligent person. How is it you are still mired in LDS quicksand. Your comments on how Joseph Smith knew so much about the Arabian peninsula is without merit. 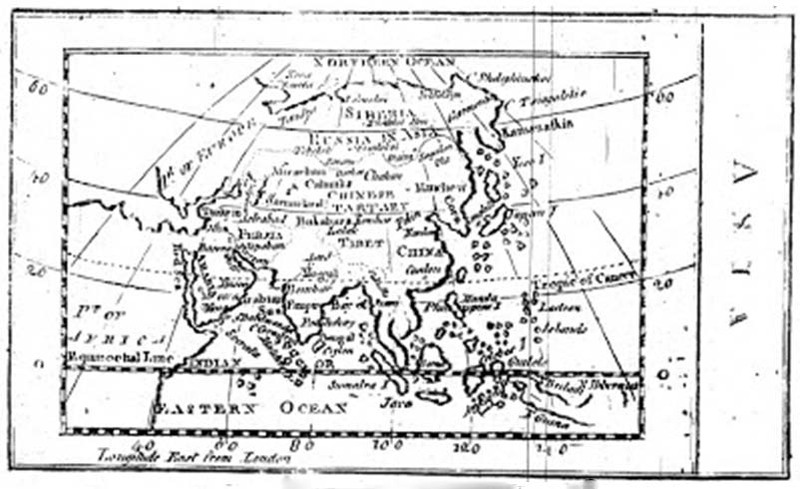 There existed in his time a school book entitled Geography Made Easy, Jedidiah Morse,1813. Smith lived just 2 miles from Palmyra,NY. Where there were several bookstores and a library. No record of his visit though. He also received regularly the Palmyra Register, and later the Wayne Sentinel. The offices of which served double duty as a library. He had ample access to this information. How do you respond to this fact! I'm missing something here, so I'd appreciate your help. Just how does Jedidiah Morse provide Joseph Smith with the information he needed to impress so many of us over 150 years later with the apparent "direct hits" in the Arabian Peninsula? Our critic, of course, was behind the times. There were better maps in Joseph's day, though they probably weren't available to him. Printed in Europe as high-end productions, some of them predating the Book of Mormon have an important advantage: they show a name related to Nahom, written as either Nehem or Nehhm, in the district north of Sanaa that has long been associated with the Nihm tribe. Is that where Joseph got Nahom? And is that where he got the Valley of Lemuel, the River Laman, Shazer, the eastward turn at Nahom, and the remarkable place Bountiful? James Gee gives a review of such maps in his "The Nahom Maps," Journal of the Book of Mormon and Restoration Scripture, 17/1–2 (2008). You can view a low-resolution PDF (2.9 MB) of his article, or download a detailed, high-resolution PDF (110 MB). You can also view high-resolution images of many maps of Arabia in the David Rumsey collection at DavidRumsey.com. Perhaps the most promising candidate proposed by critics as Joseph's magical map for crafting First Nephi is the “New Modern Map of Arabia,” D’Anville, with Improvements by Niebuhr, published by Laurie & Whittle (London, 1794). In 1794 they published a guide for travelers in the Middle East called “The Oriental Navigator,” which included a beautiful map of Arabia. You can see it in detail at DavidRumsey.com. Here's a close-up of the region around the Valley of Lemuel and the River Laman. Now do you see how Joseph came up with that? Perhaps not. Here's the section with Nehem. Yes, it's there. Now can you see evidence for Bountiful on the east coast? If so, please let me know! And if you can tell that Nahom is where the trail turns east, also help me see that. At my age, my eyes just aren't as sharp as they used to be. Take a look at any of the old Arabian maps and tell me how anyone or any group collectively can explain First Nephi. And also please tell me why Joseph neglected so many of the treasures on these maps? If he used a map to add a little "local color" as one professor claims, where is the color? Why pluck one minor element that nobody has ever heard of and neglect all the interesting sites that would have provided such color? Mecca, Medina, Arabia Felix, Jethro's Cave, etc. — why neglect those treasures in favor of one obscure name? And if you knew that your story had some evidence built into it like a name matching an actual place on a relatively unknown map, why not later have one of your peers pretend present the map to the world and announce the excite correspondence? Why neglect the evidence that you went to the trouble of building into the Book of Mormon, leaving it for future generations to discover on their own nearly 150 years later? Theories of fabrication based on Joseph's study of a map do little to explain the origins of the Book of Mormon and raise more serious questions than they answer. The problem with these more advanced maps is that they were much less likely to have been available to Joseph Smith. Jedidiah Morse's map was within reach of Joseph if he had wanted to study Morse and learn a little geography. As for maps showing Nehem/Nehhm, so far there's no evidence of any being within 100 miles of Joseph Smith, but that could change. Even if he had such a map pinned up on his bedroom wall, it's hard for me to see any evidence that he was using it. But yes, if he wanted to pluck a random name of the map and then adjust the vowels to correspond with a Hebrew name, he could have selected Nehem. Turning back to what Joseph could plausibly have done with materials nearby, my search through Jedidiah Morse's Geography Made Easy has proven to be most disappointing. Was there a secret companion volume that Joseph might have used? After patiently downloading the 26 megabyte PDF file containing the scanned book (click here and then click on the "PDF" button), I was expecting a lengthy discussion of Arabia to be among its 337 pages. Instead, there is one short page of text and one map of Asia, neither of which I found helpful. 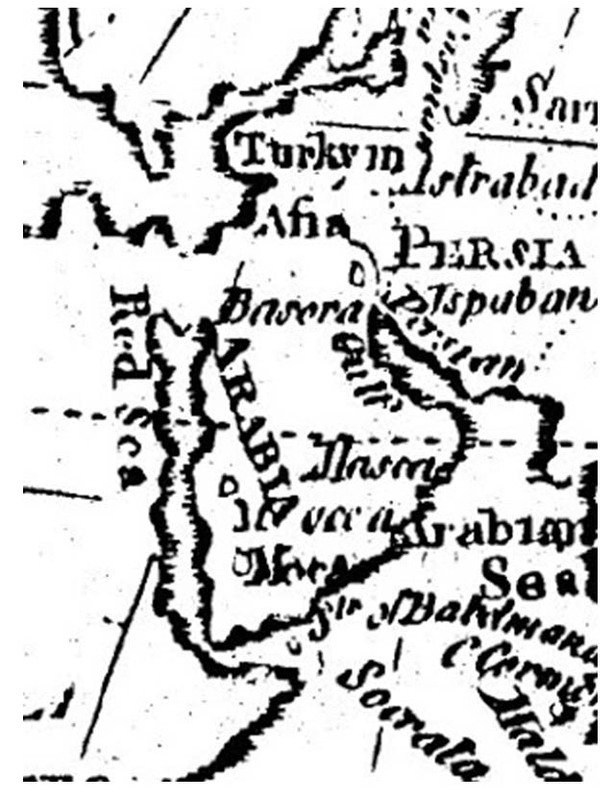 The text and map are below, with a zoomed-in section showing Arabia. Click to enlarge. 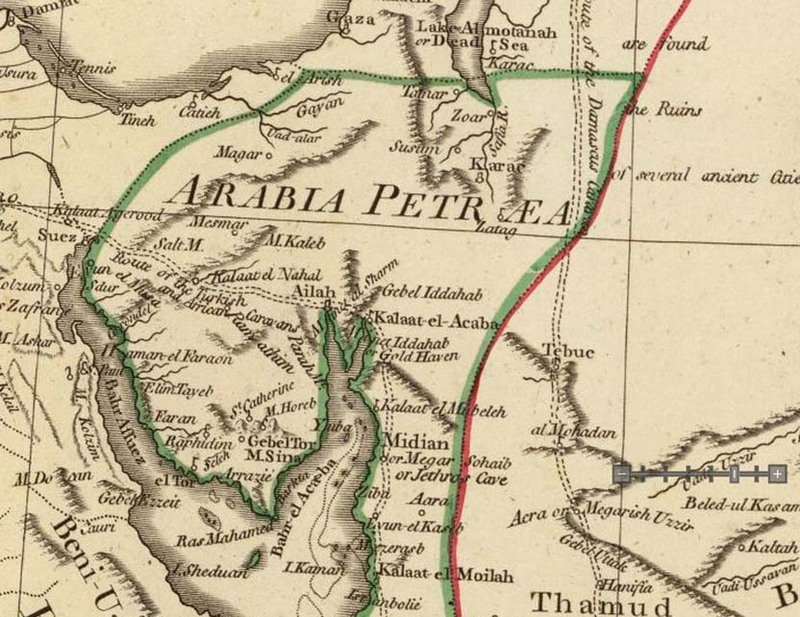 While the colored map that was printed in 1828 shows "Felix Arabia" along the southern coast, we do not have that feature in the black-and-white map in Morse's earlier book. But we do have a mention of "Happy Arabia" (Arabia Felix). Was this enough to guide Joseph Smith? The middle, called Arabia Deserta, is overspread with barren mountain, rocks and sandy deserts. 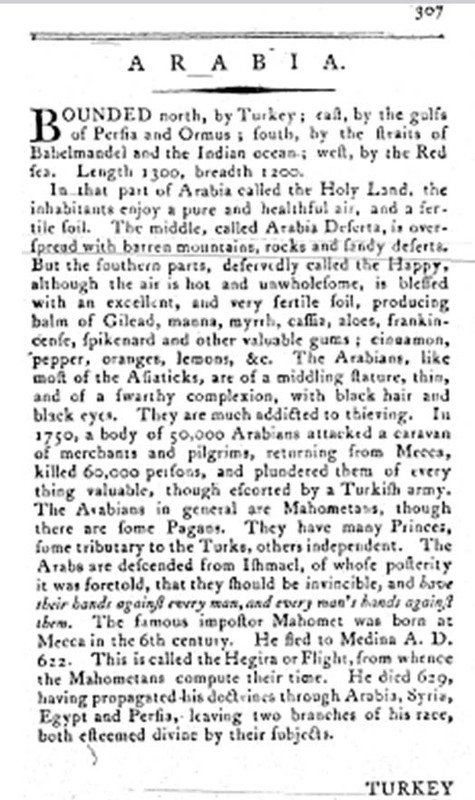 But the southern parts, deservedly called the Happy, although the air is hot and unwholesome, is blessed with an excellent, and very fertile soil, producing balm of Gilead, manna, myrrh, cassia, aloes, frankincese, spikenard, and other valuable gums; cinnamon, pepper, oranges, lemons, etc. Hmm, I'm struggling with this. There doesn't seem to be much guidance given as to how one goes from Jerusalem to Bountiful, or where Bountiful is. Instead of Bountiful on the eastern coast, where excellent candidates exist, the best we can do based on Morse is head for the more southern parts — but how to get across all the barren rocks and sandy deserts of the middle section? And once we get to the south, mind you, we might expect a fabricated Book of Mormon to have Laman and Lemuel whining about the "hot and unwholesome" air, while Nephi says something like, "Behold, we did rejoice in the spikenard and other exceedingly precious gums," accompanied by an occasional miracle of healing with the balm of Gilead, perhaps after Lemuel pummels him with lemons. But such inspiring drama based on Jedidiah Morse seems conspicuously absent from the Book of Mormon, while Nephi's tale seems utterly unrelated to anything Morse describes. Joseph Smith, ever the reckless plagiarizer, didn't even have the courtesy to borrow a few of the place names that Jedidiah offered on his maps (why not mention Sana, Medina, Mecca, or especially Mocha? ), stubbornly sticking with names like Shazer, Nahom, and Bountiful. And foolishly, Joseph insisted on having Lehi's crew traipse straight through the middle section of Arabia (following a south-southeast direction that would later be understood to be completely plausible), and then, having buried Ishmael at Nahom (the name corresponding to an ancient burial site and an ancient tribe in that region, verified by the modern discovery of engraved altars from that era), Joseph completely disses Morse by failing to continue south into Happy Arabia, but instead has Nephi turn nearly due east — in a strangely plausible manner that bypasses the deadly Empty Quarter, heading for the eastern coast, where they encounter Bountiful, a place so pleasant that Laman and Lemuel don't want to leave, a place that now, long after Joseph's day, appears remarkably plausible with a recently discovered candidate at Khor Kharfot. Perhaps the hot and unwholesome air of Happy Felix scared Joseph off. But I still insist it was a missed opportunity for our careless fabricator, even though you have to admit he got awfully lucky with his wildly uneducated guesses about the Arabian Peninsula. It's all so lucky it's almost as if First Nephi were written by someone who actually traveled through the Peninsula and saw places like the Valley of Lemuel, Shazer, Nahom, and Bountiful, where the arguably plausible candidates are indeed nearly due east of the ancient burial place Nahom/Nehhem/Nehem. Frankly, Joseph Smith's vast frontier library might as well have burned its copies of Jedidiah Morse's works, for all the good they did him. But that's just my opinion, and I am still struggling to find an answer for our friend who is convinced that Morse gave Joseph Smith all he needed for the lame "revealed" text in First Nephi dealing with the journey through the Arabian Peninsula. Any hints? Am I missing something? Did Morse, like Solomon Spaulding, have a secret second manuscript with the real stuff that Joseph stole? Perhaps Arabian Geography for Dummies and Charlatans: The Hidden Manuscript? Or perhaps a magic map of mystery pinned up on his wall? I welcome your feedback.